Could a bottle rocket be up scaled to achieve orbit? Could you construct an orbital stick stabilized rocket, by scaling up a firework? Based on Single-stage-to-orbit, I don't think so. This article quotes Robert Truax who said that the structural weight needs to be aggressively minimized for SSTO, which is what your question asks about. Bottle rockets use paper as the main component of their structure, and that's not going to be strong and light. With the change "Materials would not be the same of course..." The issue is still that SSTO is hard, and multiple stages offer advantages over a single. For example, from that same Wikipedia article, the stages can be engineered to maximize efficiency for their particular role in the trajectory of the flight. You'd get much more bang for the buck by making a two-stage bottle rocket than a large single-stage rocket. The classic bottle rocket design is optimised for stability during launch at low cost. The stick part both acts as a launch rail and keeps the center of drag well aft to prevent tumbling. The cost of this is weight since you effectively fly with part of your launch system still attached and the drag could be achieved with fins or avoided entirely with thrust vectoring. So for any rocket with active control there is no advantage, and for uncontrolled flight fins and a launch rail will get more out of the same engine. If the objective is to fly a long structural element as the payload itself then it becomes a bit different, since there are structural problems with flying a long thin structure on top of a long thin rocket so putting it alongside might be made to work. It will produce more frontal area and thus drag but may allow a lower rocket structural weight since loads from the high thrust stages can be directly applied to the spar rather than through the upper stages. You probably would not want the spar extending past the first stage engines, both because of the heat effects and because it will block the thrust vector you need to keep thrust through center of mass, even if you have a twin structure your engine out modes may require vectoring through the spar/s unless you are launching enough of these things that simpler design can be traded against a percentage crashing (if this question is part of OP's series on space elevators). Stage separation also becomes much more complex since you need to avoid striking the payload spar. Yes. 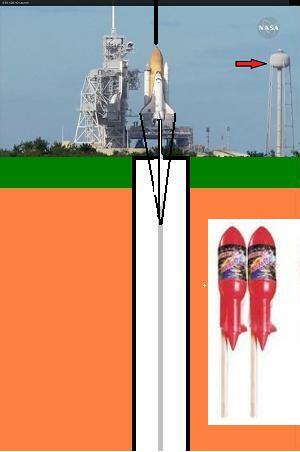 The physics involved in thrust are independent of scale. A bottle rocket that is three hundred kilometers high and 100km in diameter will blast off and into orbit with little difficulty. The problem is if we can make one big enough. The answer to that is no. Can we successfully launch one without destroying the surface of the Earth? Probably not. Not the answer you're looking for? Browse other questions tagged launch spacecraft physics or ask your own question. Water Powered Rocket to Orbit? Theoretical: Could a heavily modified airship enter low Earth orbit? Any known, verified examples of sabotage of a launch vehicle bound for orbit? Is there a theoretical limit to the size of launch vehicles? Could a spacecraft spin so fast that it spontaneously deconstructs?